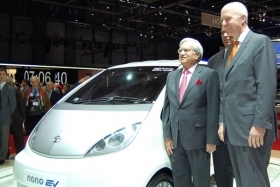 Tata's Ravi Kant (left) and Carl-Peter Forster unveiled the Nano EV at the Geneva auto show. India's top vehicle maker, Tata Motors, plans to bring an electric version of the Nano, the world's cheapest car, to Europe within three years. Ravi Kant, Tata Motors vice chairman, said the electric Nano, which was unveiled at the Geneva auto show will be also reasonably priced. “It is too soon to give a precise price target for the electric Nano, but we at Tata are very price conscious for all our products,” Kant said. The UK and Scandanavia will be the first markets to get the electric Nano. Kant said there were no immediate plans to sell the zero-emission Nano in India. Tata plans to begin European sales of a gasoline version of the Nano in about 18 months as it aims to expand its reach beyond India and other emerging markets. No price indications were given. Kant also said the UK will receive the electric version of the Vista small car by the year end. The gasoline and diesel Vista, already on sale in India, replace the Indica hatchback. Other European markets will get a Vista electric variant during 2012. The UK will be the first market because, like India, it is a right-hand-drive country. Tata said the Vista electric car has a 200 km range, while the electric Nano has a160 km range. Both vehicles use lithium-ion batteries. Tata said it has already sold 100,000 Nanos in India, which priced at $2,500 for its entry model.